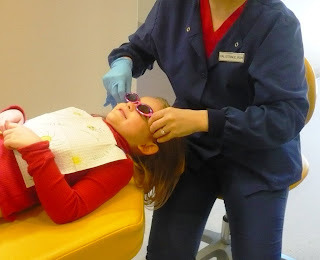 So I took my kids to the dentist for the first time last week, and, yeah...they are 8 and 6. No judging y'all, this is a judge-free blog. Especially about avoiding dentists. Seriously. 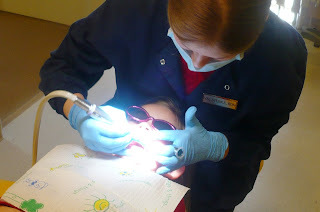 Not only that, I allegedly planted a little fear into my kids, telling them that if they didn't let me brush every tooth until the bristles were flat, or open their mouth wider than a Black Hole so I could floss, that I would SO take them to the dentist where it would be MUCH worse than my frantic and forceful scraping/scrubbing/flossing. Some would say that is not a good method for introducing good oral hygiene. You're right. Don't judge. 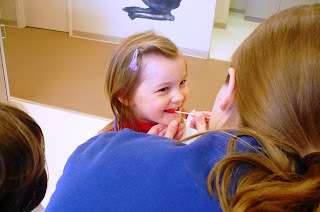 Added to that, I WAS slightly embarrassed that other mothers were taking their one-year-old babies to get their "winter teeth" polished, "flourided" and sealed, while I was keeping the morning brushing routine an option (stop judging). I was pretty sure that CPS would be hiding in the corner of the dental office, waiting to jump me when I was forced to confess to the Hygienist my terrible mothering ways and utter disregard for professional dental care. This fear kept me from making an appointment for like, ever. But then my son developed some tartar, and I read about some kid dying of a tooth absess, that turned into a brain infection, from not going to the dentist. I made the appointment. 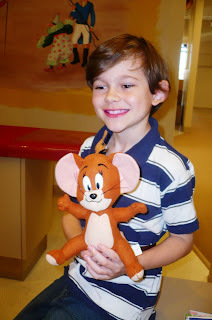 I found a pediatric dentist, which made me happy. That call was my first contact for the confession. 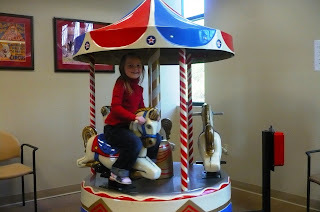 Receptionist: "When was the last time your kids saw the dentist?" Me: "I'm afraid of those papooses!" So the appointment was made, and the task of getting the kids "excited" was daunting as we inched toward D Day; Dentist Day! Me: "Kids! So exciting! We get to go to the dentist!" What I expected: A small waiting room with two magazines, 3 chairs, and some nasty Legos in the corner while we waited 2 hours to torture my kids. What I got: Well, this. 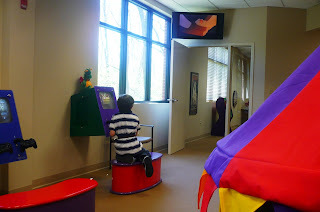 So instead of tearing the kids away from the front door, I tore them away from the videogames/movie/play tent/carousel after only 5 minutes to meet the Dental Hygenist. What I expected: A sterile white room with a papoose waiting for each of them, two crazy kids crying, and EVERYONE telling me what a horrible mother I was and that this was all my fault. What I got: Well, this. Funny pink stuff! Next we went into a room with dual chairs and a nice place for me to sit and watch. There were paper mache animals everywhere, bright colors, sunglasses for them to wear, books and animals to look at /play with, and hapiness abounding. What I expected: The Hygenist forcing me and my frightened, waiting child out of the room, while my other frightened screaming child was tied down, scraped, polished, flossed, had water shot down his windpipe, his tonsils sucked out with the monster vacuum, and was forced to wear those horrible teeth cups filled with the Flouride Liquid from Hell that you swallow and die instantly from. And, flouride is now brushed on and simply washed away, did you know that? (all the GOOD mothers are nodding their heads violently). And then lastly the X-rays, which make you gag, cut the inside of your cheeks, and cause you to fear 3-D glasses. Then the dentist came in. This was where I really expected to get it, especially after hearing the Hygienist whisper. "this was their FIRST time!" My poor children never had the opportunity to grow up getting used to the dentist, and because of my terrible neglect, they had 20 cavities and had to have 4 root canals each, and have teeth pulled and those little fake teeth inserts made so they wouldn't look like old men until they were 10 years old. I must say the dentist did act shocked; I could tell she really wanted to be disappointed in me and make me out to be an awful example. But, all she could say was, "you take really good care of your kids' teeth!" OH YEAH! THAT'S WHAT I'M TALKIN' ABOUT!!! So yes, I will take them in 6 months to get the big fancy X-rays and the sealant on their teeth. After that I might have to get a job to continue this every-6-month schedule. But for now, they get to chew sugarless gum, use ACT once a day, and continue to get better at brushing and flossing on their own, because frankly I am sick of having food particles shoot into my eyes every time I floss their teeth. No judging here, honey. I didn't take my kids right away either.When I do take them, it does seem they are trying to find something so they can get all judgy on me. But I also brush my kids teeth religiously. I still do the 8 year old. I will let her do it, but then I tell her to do it again. Then I say, brush your tongue, no one likes bad breath. But you got me thinking, I need to make appointments. The kid died because of a tooth problem!!?? I rather go to my gyno. No fear of drilling at the gyno. 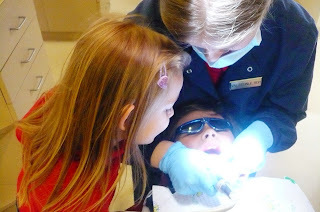 What a terrific first dentist trip for them (and you!). My niece is graduating as a Pediatric Dentist this May...I will send her this along to her to show her how cool the office was so she can be inspired!!!!! Oh yeah R.O. this place was wonderful! I had no idea it could be this easy! I just remember my "fun" experiences at the dentist as a kid, hence my hesitation on taking them. But the kids LOVED it...so worth the huge amount of money I scraped up! 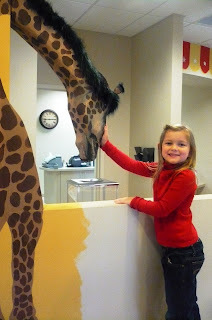 You can show her more of it, look up Childrens Dentistry, Lexington Kentucky; should take you to their site!! i must say. that's the cullest dentist office ever. hopefully, and i'm going off of the pictures here, the dentist isn't michael jackson. i suppose next time you'll be more excited about the dentist and you'll yell at your children to vartanamos. just like dora does to boots. Stop by my blog, funny girl! You have an award waiting for you1 (I think you got this one already, but what the heck, what woman can't use another award?) They are like diamonds...one is never enough!! wow kim! are you sure this guy won't see me when i come down?? me skeered of the big bad dentist! i am having fear. i need to be better about enforcing my kids brushing habits. no judging here girlfriend. I'm going to start petitioning my dentist to start adding some of that stuff to her office. Seriously...I'd like a giraffe and some tents. 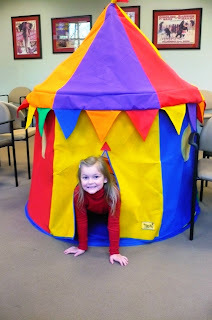 WOWZA that is some office... i just take my kids to my dentist and they've never had an issue but I want a circus tent in my dentists office!!! I took my kids a few months ago for their first real cleaning and exam. I felt really bad when another family came in the door with three kids, all of which were toting a plastic baggy with a toothbrush and FDA approved kids toothpaste. These three mutant kids walked in the door, went to the bathroom and brushed their teeth for 5 minutes. My kids just looked at me and said, "Um, we should have brought our toothbrushes too. Why didn't you bring our toothbrushes. You stink as a mom, Mommy." Ok, so that last part was what I said to myself. 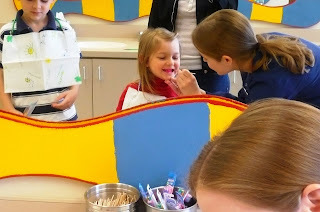 But my kids did great and I was SO proud when the dental hygentist came out, pronounced perfect teeth for both of my girls and said "They have such nice manners!" Yes everyone, it really IS that cool of a place! And yeah Aria, that was the whole reason I waited so long! 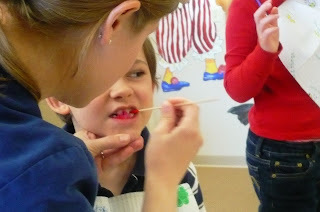 My days at the dentist as a child were beyond torturous, and I didn't even have cavities!